This is an outdoor event with up to 80 sellers, Jewelry, Slabs, Cabs, and Rough stones of all kinds. Tools, equipment, and other lapidary related items. Contact info is klueysgems@yahoo.com; phone is 760-917-5781. 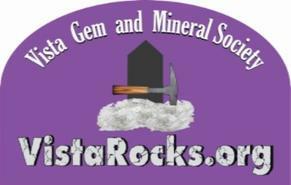 Membership in the Vista Gem and Mineral Society is open to anyone interested in mineralogy, gemology, and related educational subjects. Annual dues are $15 for individuals and $25 for families.